(poke poke) It’s time to write that exchange fic! Oh. It’s that white van again, and they have the straightjackets this time. Bye! Anyway, the point is that with MD, I could design anything! Authentic robes! Non-ho clothes for Ginny! Yay! 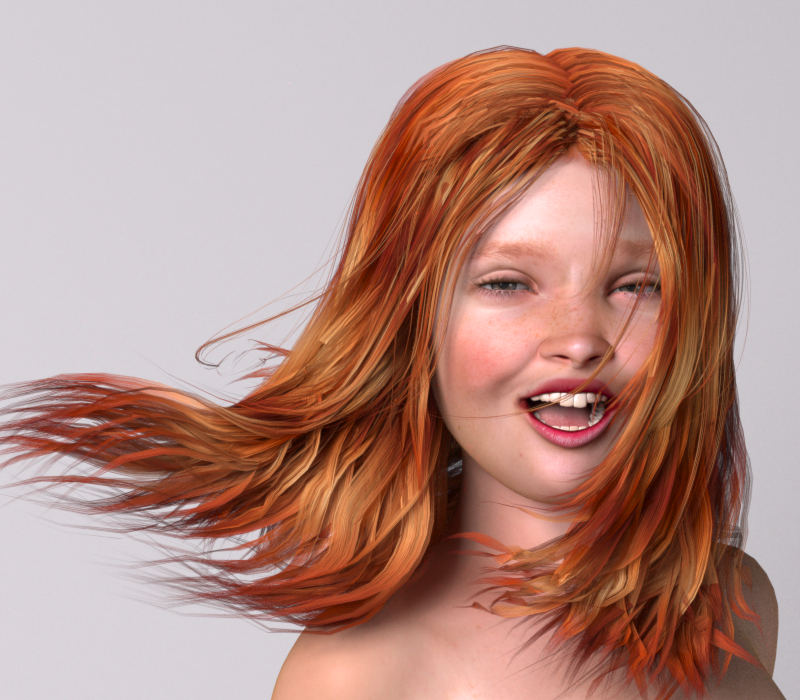 Here’s a render of Ginny, NOT done by me (but by Jonasb67.) It’s an example of what can be done with Poser and Reality 3, a plugin for LuxRender, the only computer rendering engine I’ve ever seen that produces true photorealism. It can also be very painterly, which we see in this example. Again, not by me, but I’m going to spend the next couple of weeks seriously studying Reality… (very existential.) It’s very very very very very complex and difficult. 😛 But the results that you can get are almost not to be believed. Well, then it could get very weird. But it can be done. 🙂 I’m thinking about getting FaceRoom. And the D/G Exchange Writing Begins!! So the picking of the prompts is CLOSED!! Well, all except for the two people haven’t sent in their picks yet, and Y’ALL KNOW WHO YOU ARE… SO SEND THEM IN. All of the prompts are sent out except for #5 and #13. LAST DAY OF PROMPT PICKING!!! 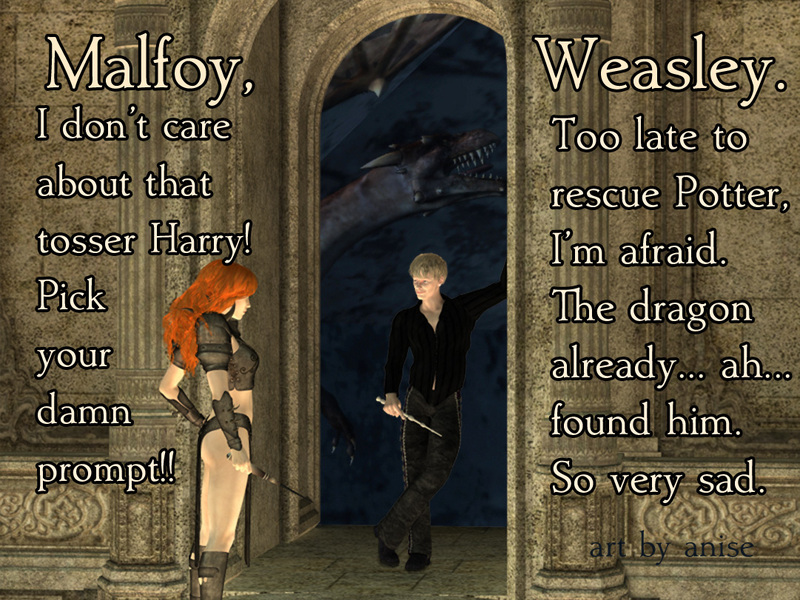 See what Draco is going through? Don’t let this happen to you!! Next to Last Day of Prompt Picking!! Day FOUR of prompt picking!! 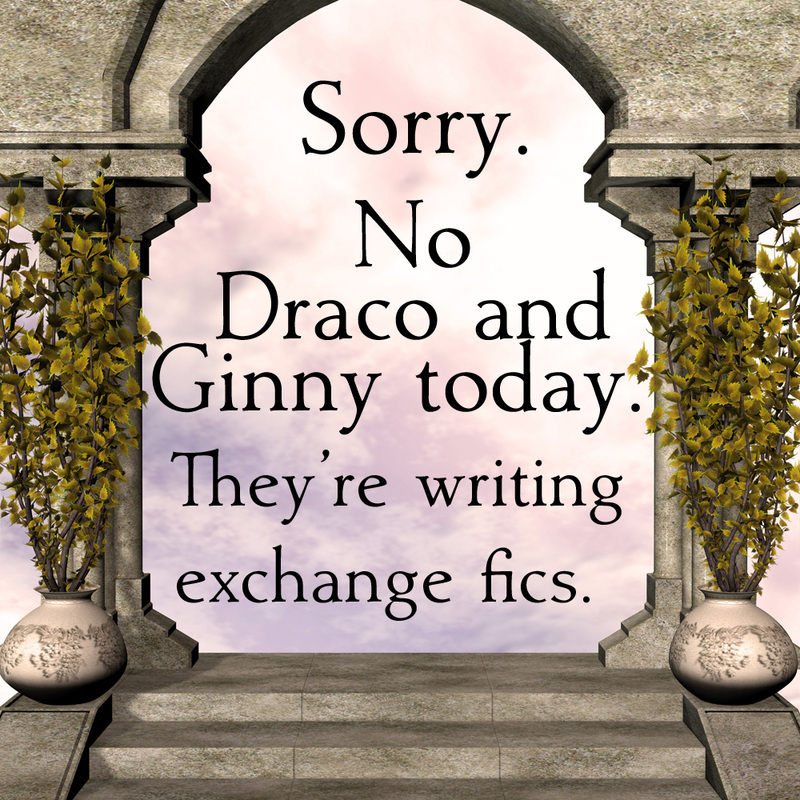 Pretty much the same news as yesterday… the number of prompts is dwindling fast! There are just two days left to pick yours, if you haven’t already. And here’s the promised Part 2 of the “D/G Contentment” graphic strip. I think I’m going to do more of the multi-parters. Day THREE of prompt picking! I’ll tell y’all what, if you haven’t gotten over to the LJ yet to pick your exchange prompts, this is a GOOD time to do it. There are only three more days to pick, and while there are some prompts left, they are going fast. So head on over there and make your choice, if you haven’t already! 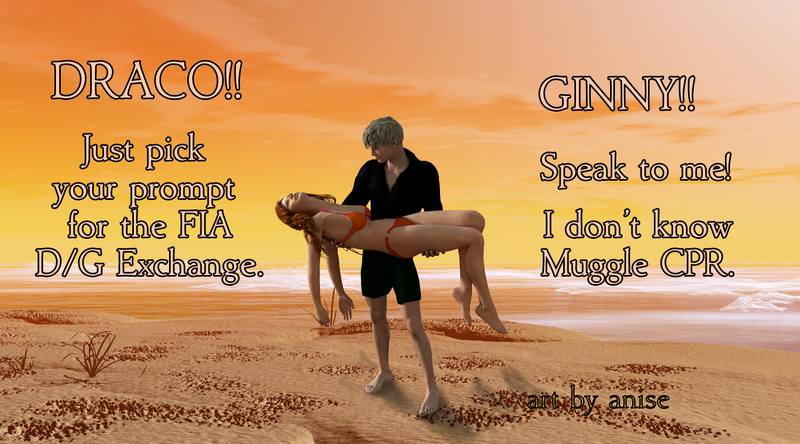 For more inspiration, here’s the first of a two-part graphic series with Draco and Ginny. This entire thing might eventually develop into a graphic novel, for all I know. 😉 Wow, I really worked on this one, and I’m still not totally happy with it. There were originally some horrible shadows that had to be taken out, and then the background wasn’t in the right focus, and etc etc and etc… oh, and Ginny’s skirt is HAND PAINTED BY ME. P.S. : I still don’t know if anything can be recovered off that drive. Hopefully, there will be more news soon, and it’ll be good! And the Prompts Are All UP!! So the happy day is here, and all of the prompts are up on the LJ page!! 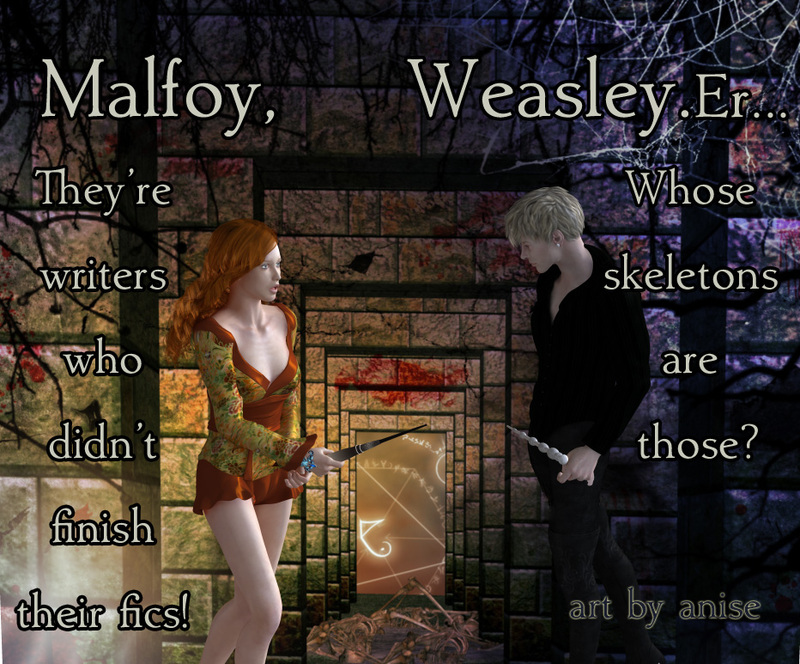 It’s time to go over there and pick your prompt, and a few are already gone… so you do NOT want to wait on this one. Just head on over to the LJ site, and as always, click on the pic above to get there.